Naipes La Española by Vigor S.R.L. 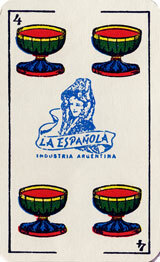 Naipes La Española was one of Vigor's leading brand of Spanish-suited playing cards, alongside Naipes Barcelonesa, La Estrella and Chinita. Previously these had been produced by Igor Domicelj (c.1950-55) who was the company's predecessor, operating at the same business address: Tejedor 244-256, Buenos Aires. The logo on the fours of cups and coins, and the wrapper (or box), depicts a Spanish lady wearing a shawl beneath a Moorish archway. The box also depicts a bull-fighting scene. Over the years the company name and details changed, and various different box designs were published, but the cards inside were always the same. The original Patent Office Registration document, dated 22nd June 1955, shows early designs for the box and card backs. 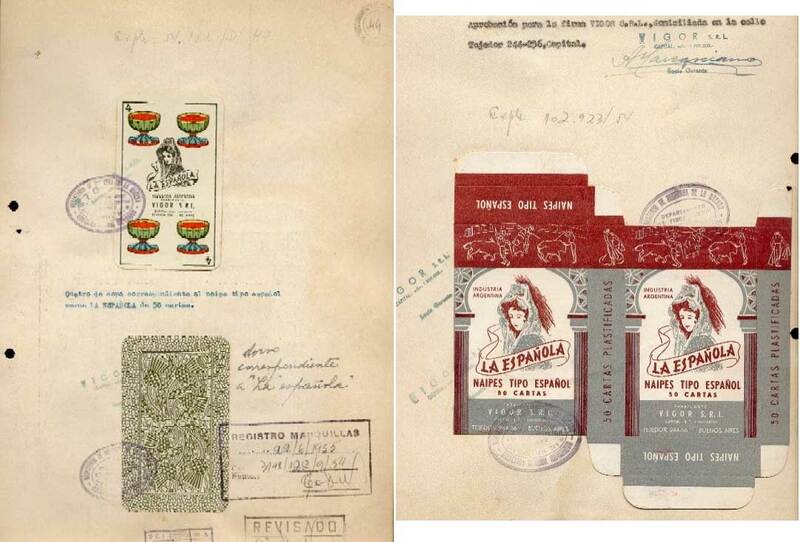 Click the images below to see successive editions of Naipes La Española. 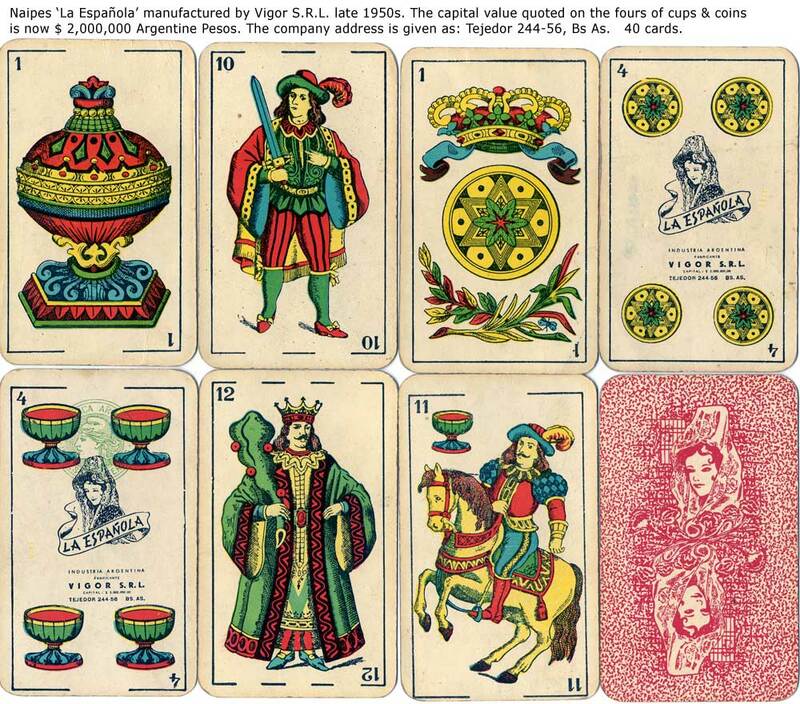 Left: four of cups and box from Naipes La Española manufactured by Vigor S.R.L. c.1955. 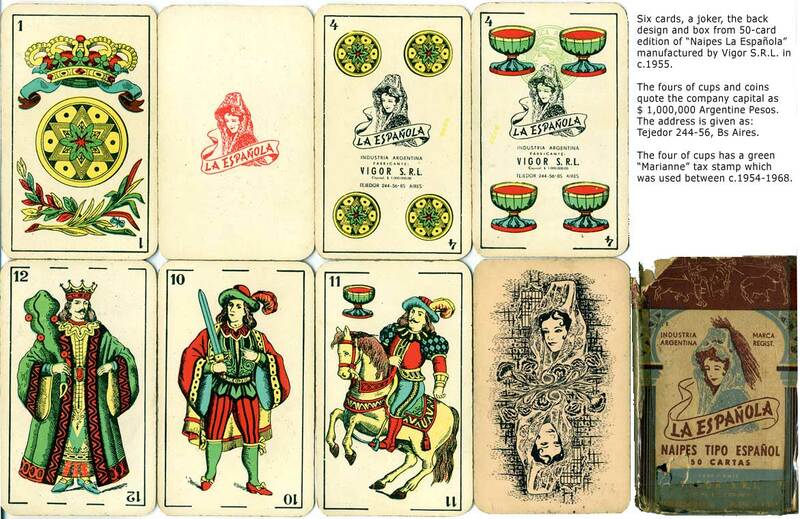 Right: four of cups from slightly later edition of Naipes manufactured by Vigor S.R.L. c.1958. There are slight differences in the typography and information printed on the four of cups, in particular the capital value of the company is now $ 2,000,000 pesos. 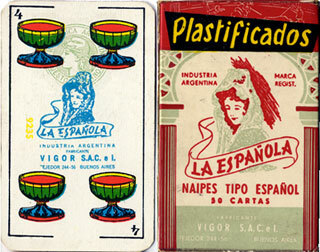 Left: four of cups and box from Naipes La Española manufactured by Vigor S.A.C. e I., 1960s. 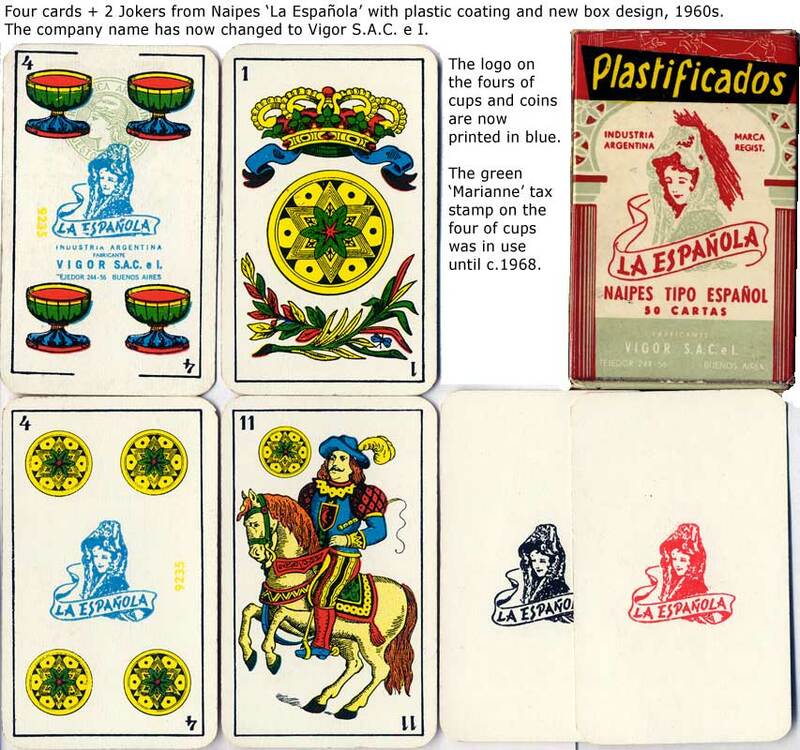 Right: four of cups from later edition of Naipes La Española, 1970s. There are no details on the cards, but the manufacturer's address is now given on the box as: Calle 58 Ex Lamadrid 1.400 Villa Maipú, San Martin. This is the address for Gráfica S.A. who appear to have taken over the brand. 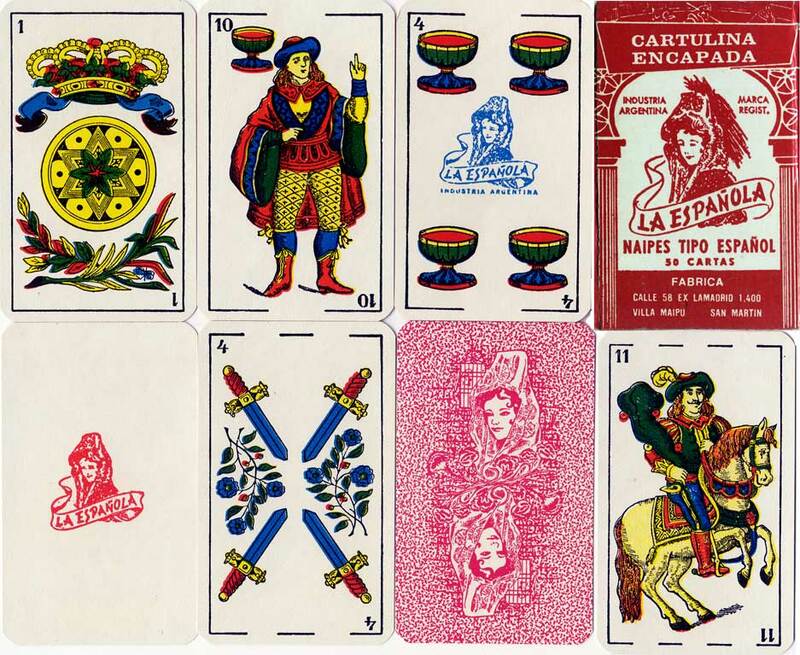 In all the above examples, the actual card designs are based on those of Segundo de Olea (Cadiz, Spain) which had been imported into Argentina since the 19th century. They are still used today by Gráfica 2001 / Naipes La Española who have adopted this old brand name as the new company name.